A recent addition to the RUNNINGINJURY.co.uk store is the ‘Running Injury Recovery Program’. As you can tell by the spelling, this is an American recovery programme. But the style of the programme is decidedly British. In this post, we highlight some of the key features of the recovery programme – and why we think it’s a step above your average running injury solution. A key problem with many rehab programmes is that each runner is often treated alike. It’s common to find a one-size-fits-all approach that doesn’t recognise a simple fact: all runners are different, with different running histories and different existing imbalances and faultlines. A genuine recovery programme has to recognise that fact. 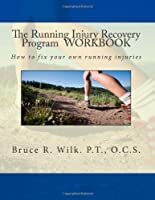 And that’s one reason why it was refreshing to stumble across the ‘Running Injury Recovery Program’ – authored by Bruce Wilk, and supported by his 30 years of experience as a runner and therapist. This is a two-part approach to restoring running fitness. Part 1 provides the theoretical background to understanding your injury and the exercises you require in your rehabilitation. Part 2 is the practical element, which walks you through the individual steps you need to take to return to health. First of all, it’s important to make use of knowledgeable training partners or coaches to avoid the occurrence of injuries. Have a Plan B! Be prepared to adjust straight-away to injury, including through undertaking other exercise activities. Finally, it’s crucial to maintain perspective on your running, something that’s made easier by maintaining healthy relationships with those why may not be in your regular running circle. For a limited time, we’re offering both elements of the programme at a superb price in store today – just click below to access your special deal while stocks last.